Walvis Bay is a popular destination for cruise ships as it has a natural deep water harbour. The city and the bay on which it falls got the name Walvis Bay (meaning Whale Bay) from the many Southern Right Whales that are attracted to the area each year. The bay is rich in wildlife with large numbers of pelicans and flamingos that can be seen around the shore and lagoons of the city. A relaxing stroll from your cruise ship to the famous lagoon area is not to be missed during your stay in Walvis Bay. 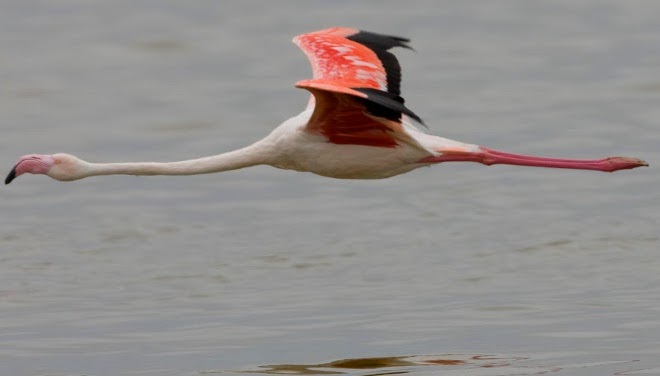 Watch the flamingos in their natural habitat and marvel at their spectacular colours. If you are looking for a bite to eat or a spot of shopping, head down to the quaint Walvis Bay Waterfront where you will find lovely shops and restuarants. 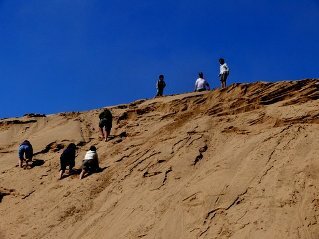 Visit the famous Dune 7, one of the highest sand dunes in the Namib desert. Here, the kids and the young at heart can enjoy quad biking as one of MSC's arranged shore excursions. Cruise passengers can also opt for a tour of the nearby town of Swakopmund where German architecture reigns supreme. All passengers will need a passport to go to Walvis Bay as you will need to go through South African immigration on departure and Namibian immigration on arrival into Walvis Bay. South African passport holders do not need a visa to enter Namibia. South African Rands are accepted in Namibia. 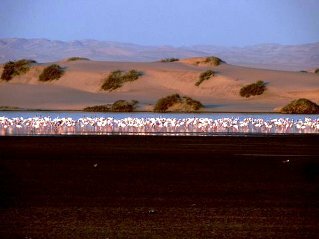 For most cruises to Walvis Bay, you will arrive in the morning and get the opportunity to spend the day exploring before you need to get back onto the ship in the early evening. Plenty of time to do it all! Do you know that if you book a cruise with us and share your photos afterwards, we'll give you a small credit towards your next cruise. Just email them to cruises@southafrica.to. Here's a review by Alison Guy of her cruise from Cape Town to Walvis Bay, and some photos which Lucile was kind enough to share. Photos from Lucille's cruise on the 7th January 2013. On the 3rd of December 2012 I was lucky enough to embark on my first ever cruise experience. It was a week of memories that I will always cherish and would recommend to anyone. The feeling of watching the waves hit the side of the magnificent MSC Sinfonia as you look out over the endless ocean is indescribable. Check-in and Embarkation took place at Duncan Dock E Berth in the port of Cape Town. Although we had to wait in a few queues, the process ran smoothly and our passports and tickets were checked and our cruise cards issued in less than an hour. We were then free to explore our home for the next 4 nights, the MSC Sinfonia. Lunch was being served and we sat down to a leisurely lunch at the buffet, overlooking the Cape Town harbour. Once all passengers were on board and we were ready to set sail, we were called to take part in the compulsory emergency drill. Although many people find this process tedious, I found it quite fun as we all had to put on our life jackets and assemble at our emergency assembly point, alongside our assigned life boat. People forget that knowing how to properly put on your life jacket and knowing where to go in case of an emergency could save your life. We were booked in an inside cabin with no window on the 9th Tchaikovsky deck. Our cabin was neat and cosy and our cabin attendant, Joana, from Madagascar was very helpful and friendly. After all passengers had been briefed on emergency procedures, it was time to set sail from Cape Town! We set off at the time scheduled, sailed past Robben Island and took to the Atlantic Ocean. There is so much to see and do onboard the Sinfonia. Relaxing by the pool with a cocktail, swimming, sitting in the jacuzzi, putt putt, bingo, going to the casino, shows and games. Each evening a daily schedule is delivered to your cabin, outlining the activities and shows on offer for the next day. All your meals onboard the cruise are included in your cruise fare. You can choose to have your meals at your assigned restaurant or at the buffet. There is always plenty of food at all times of the day, so there is no chance of going hungry. Water, ice, tea and coffee are available free of charge in the buffet area 24 hours a day, and juices are available at the breakfast buffet. All other drinks are excluded. The cocktails are delicious and there is a good selection of wines, South African beers, ciders and spirits. From 6am on the day of arrival into Walvis Bay, the sand dunes of the town's landscape were visible from the ship's deck. Once we arrived at the port, we were free to disembark after going through Namibian immigration. After an early breakfast onboard, we took a leisurely walk around the sleepy Namibian town, stopping for a coffee at the waterfront to watch the pelicans fishing in the bay. The lagoon is beautiful and flamingos are everywhere you look.